This tutorial describes the workings of the phrase-based decoder in Moses, using a simple model downloadable from the Moses website. Let us begin with a look at the toy phrase-based translation model that is available for download at http://www.statmt.org/moses/download/sample-models.tgz. Unpack the tar ball and enter the directory sample-models/phrase-model. moses.ini the configuration file for the decoder. This entry means that the probality of translating the English word the from the German der is 0.3. Or in mathematical notation: p(the|der)=0.3. Note that these translation probabilities are in the inverse order due to the noisy channel model. The translation tables are the main knowledge source for the machine translation decoder. The decoder consults these tables to figure out how to translate input in one language into output in another language. Being a phrase translation model, the translation tables do not only contain single word entries, but multi-word entries. These are called phrases, but this concept means nothing more than an arbitrary sequence of words, with no sophisticated linguistic motivation. Loading the LM will be faster if you build a binary file. The ARPA file is missing <unk>. Substituting log10 probability -100.000. Here, the toy model managed to translate the German input sentence das ist ein kleines haus into the English this is a small house, which is a correct translation. The decoder is controlled by the configuration file moses.ini. The file used in the example above is displayed below. We will take a look at all the parameters that are specified here (and then some) later. At this point, let us just note that the translation model files and the language model file are specified here. In this example, the file names are relative paths, but usually having full paths is better, so that the decoder does not have to be run from a specific directory. How the decoder works is described in detail in the background section. But let us first develop an intuition by looking under the hood. There are two switches that force the decoder to reveal more about its inner workings: -report-segmentation and -verbose. house was generated from the German word 4-4, haus. echo 'ein haus ist das' | moses -f phrase-model/moses.ini -t -weight-overwrite "Distortion0= 0"
A short summary on how many translations options were used for the translation of these sentences. The stack sizes after each iteration of the stack decoder. An iteration is the processing of all hypotheses on one stack: After the first iteration (processing the initial empty hypothesis), 10 hypothesis that cover one German word are placed on stack 1, and 2 hypotheses that cover two foreign words are placed on stack 2. Note how this relates to the 12 translation options. During the beam search a large number of hypotheses are generated (453). Many are discarded early because they are deemed to be too bad (272), or pruned at some later stage (0), and some are recombined (69). The remainder survives on the stacks. Some additional information on word deletion and insertion, two advanced options that are not activated by default. And finally, the translated sentence, its coverage vector (all 5 bits for the 5 German input words are set), its overall log-probability score, and the breakdown of the score into language model, reordering model, word penalty and translation model components. Also, the sentence decoding time is given. The pair of numbers next to a phrase is the coverage, pC denotes the log of the phrase translation probability, after c the future cost estimate for the phrase is given. Some parts of the sentence are easier to translate than others. For instance the estimate for translating the first two words (0-1: das ist) is deemed to be cheaper (-10.207) than the last two (3-4: kleines haus, -18.987). Again, the negative numbers are log-probabilities. Here, starting with the empty initial hypothesis 0, a new hypothesis (id=1) is created. Starting from zero cost (base score), translating the phrase das into the carries translation cost (-0.916), distortion or reordering cost (0), language model cost (-2.034), and word penalty (-1). Recall that the score component information is printed out earlier, so we are able to interpret the vector. Overall, a weighted log-probability cost of -2.951 is accumulated. Together with the future cost estimate for the remaining part of the sentence (-29.425), this hypothesis is assigned a score of -32.375. Confused enough yet? Before we get caught too much in the intricate details of the inner workings of the decoder, let us return to actually using it. Much of what has just been said will become much clearer after reading the background information. The key to good translation performance is having a good phrase translation table. But some tuning can be done with the decoder. The most important is the tuning of the model parameters. The phrase translation table ensures that the English phrases and the German phrases are good translations of each other. The language model ensures that the output is fluent English. The distortion model allows for reordering of the input sentence, but at a cost: The more reordering, the more expensive is the translation. The word penalty ensures that the translations do not get too long or too short. The probability p(e|f) of the English translation e given the foreign input f is broken up into four models, phrase translation phi(f|e), language model LM(e), distortion model D(e,f), and word penalty W(e) = exp(length(e)). Each of the four models is weighted by a weight. The weighting is provided to the decoder with the four parameters weight-t, weight-l, weight-d, and weight-w. The default setting for these weights is 1, 1, 1, and 0. These are also the values in the configuration file moses.ini. What is the right weight setting depends on the corpus and the language pair. Ususally, a held out development set is used to optimize the parameter settings. The simplest method here is to try out with a large number of possible settings, and pick what works best. Good values for the weights for phrase translation table (weight-t, short tm), language model (weight-l, short lm), and reordering model (weight-d, short d) are 0.1-1, good values for the word penalty (weight-w, short w) are -3-3. Negative values for the word penalty favor longer output, positive values favor shorter output. Let us now look at some additional parameters that help to speed up the decoder. Unfortunately higher speed usually comes at cost of translation quality. The speed-ups are achieved by limiting the search space of the decoder. By cutting out part of the search space, we may not be able to find the best translation anymore. One strategy to limit the search space is by reducing the number of translation options used for each input phrase, i.e. the number of phrase translation table entries that are retrieved. While in the toy example, the translation tables are very small, these can have thousands of entries per phrase in a realistic scenario. If the phrase translation table is learned from real data, it contains a lot of noise. So, we are really interested only in the most probable ones and would like to elimiate the others. The are two ways to limit the translation table size: by a fixed limit on how many translation options are retrieved for each input phrase, and by a probability threshold, that specifies that the phrase translation probability has to be above some value. Reducing the number of translation options to only one per phrase, had a number of effects: (1) Overall only 6 translation options instead of 12 translation options were collected. (2) The number of generated hypothesis fell to 127 from 442, and no hypotheses were pruned out. (3) The translation changed, and the output now has lower log-probability: -30.327 vs. -28.923. 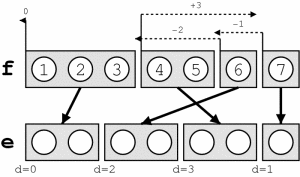 A different way to reduce the search is to reduce the size of hypothesis stacks. For each number of foreign words translated, the decoder keeps a stack of the best (partial) translations. By reducing this stack size the search will be quicker, since less hypotheses are kept at each stage, and therefore less hypotheses are generated. This is explained in more detail on the Background page. Note that the number of hypothesis entered on stacks is getting smaller with the stack size: 453, 453, 208, and 29. As we have previously described with translation table pruning, we may also want to use the relative scores of hypothesis for pruning instead of a fixed limit. The two strategies are also called histogram pruning and threshold pruning. Here some experiments to show the effects of different stack size limits and beam size limits. In the second example no pruning takes place, which means an exhaustive search is performed. With small stack sizes or small thresholds we risk search errors, meaning the generation of translations that score worse than the best translation according to the model. In this toy example, a worse translation is only generated with a stack size of 1. Again, by worse translation, we mean worse scoring according to our model (-30.991 vs. -28.923). If it is actually a worse translation in terms of translation quality, is another question. However, the task of the decoder is to find the best scoring translation. If worse scoring translations are of better quality, then this is a problem of the model, and should be resolved by better modeling. The basic reordering model implemented in the decoder is fairly weak. Reordering cost is measured by the number of words skipped when foreign phrases are picked out of order. Total reordering cost is computed by D(e,f) = - Σi (d_i) where d for each phrase i is defined as d = abs( last word position of previously translated phrase + 1 - first word position of newly translated phrase ). This reordering model is suitable for local reorderings: they are discouraged, but may occur with sufficient support from the language model. But large-scale reorderings are often arbitrary and effect translation performance negatively. By limiting reordering, we can not only speed up the decoder, often translation performance is increased. Reordering can be limited to a maximum number of words skipped (maximum d) with the switch -distortion-limit, or short -dl. Setting this parameter to 0 means monotone translation (no reordering). If you want to allow unlimited reordering, use the value -1.